Snagit’s easy-to-use tools empower you to communicate efficiently with visuals that give your ideas clarity and help you explain any subject. 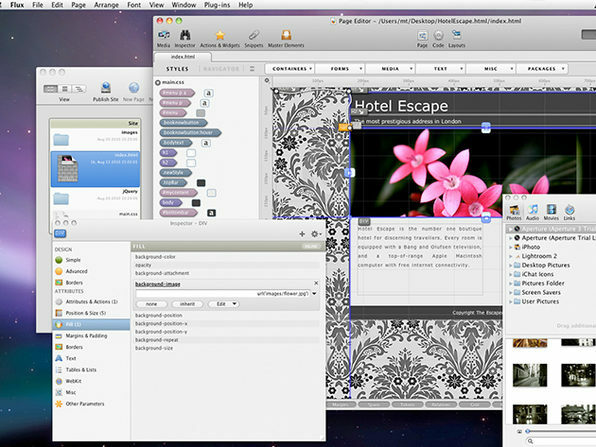 Snagit helps you solve everyday problems with ease. Whether you’re trying to explain something over email or keep your students’ attention, Snagit can help you work faster and smarter. Ever wanted the ability to easily create eye-catching images and videos in a matter of seconds? Now thanks to this amazing bundle, you can. Capture Anything – All-in-one capture tool can grab your whole desktop, a region, or a window of your computer screen, even while you’re scrolling. Create Demo Videos – Show them what you do, and how you do it! Using MPEG4 video format you can now create screen videos for demos or quick reviews, and share them instantly to YouTube, Facebook, Twitter, FTP, Screencast.com or send to Camtasia for Mac for editing. TechSmith Fuse – Get photos and videos from your mobile device straight into Snagit with TechSmith Fuse. Import an existing photo or video, or capture something new using the app’s built-in camera. 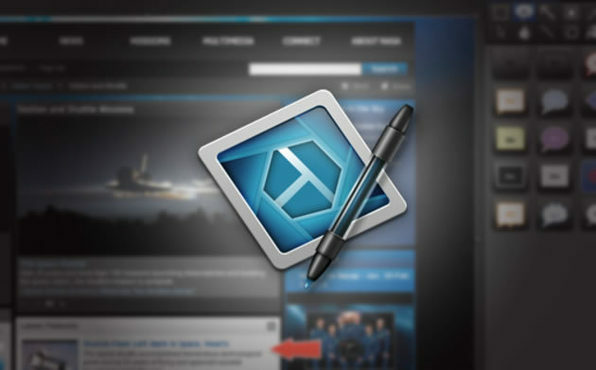 Then, use the editing power in Snagit to create custom, shareable images. Markup Tools – Draw their eye with customizable arrows, colorful speech bubbles, unique stamps, and more. Save, Share, or Send – Organize your screen captures with easy auto-storing and tagging features and send to Facebook, Twitter, and Evernote. Google Drive – Our new Google Drive integration lets you upload your images and videos into Google Drive to give your viewers access from any web browser or mobile device. You can also import files into Snagit instantly from Google Drive. Special Effects – Add effects like a special border, shadow, and perspective to your entire capture. Or create your own custom style. Combine Images – Create custom graphics easily by taking multiple captures and putting them together. Capture Tray – Archive the most recent captures and open images. Whether you need to manage server farms, travel frequently, or simply own multiple computers, Jump Desktop is a remote desktop application that lets you securely connect to any computer in the world. Using a computer with Jump Desktop you’ll have COMPLETE access to your apps and files on any other computer from wherever you are. Jump Desktop is your solution to staying connected to ALL of your devices while you’re out on the road, in a plane, or simply down the street. Simple – it’s the best product for remote desktop access on the market. Designed with your productivity in mind, it allows for Mac keyboard shortcuts while controlling Windows, and integration with Mavericks adds power-saving features into Jump’s core so battery life is preserved while using it to work remotely. 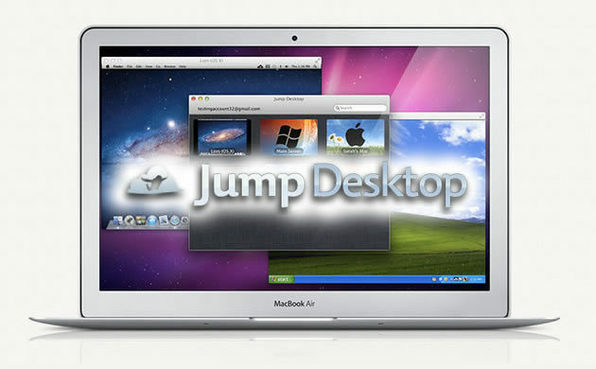 Easy Setup – Jump Desktop is very easy to configure; anyone can do it! You’ll be up and running within 5 minutes. Secure – Jump encrypts the connection between computers to ensure privacy and security. Supports NLA, TLS/SSL encryption for RDP. SSH Tunnelling and SSL/TLS encryption for VNC. Supercharged Productivity – Use Mac keyboard shortcuts in Windows. Seamlessly switch between computers without changing the way you use the keyboard. Configure your own shortcuts or use the built-in defaults. No other app comes close. Live Previews – Connect to as many computers as you want. Monitor all sessions at once with Live Preview. Filter computers by keyword or connection details using live search. Super Fast & Beautiful – Powered by one of the fastest VNC and RDP engines on the planet. Multi-core, hardware-accelerated rendering for zippy performance. Optimized for MacBook Pros with Retina display. 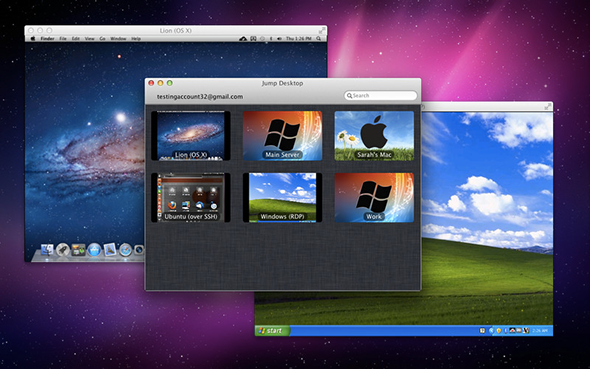 Built on Open Standards – Jump Desktop is a true RDP and VNC client. You don’t need to download additional software to connect to your machine if you already have RDP or VNC configured. Just enter your IP address or hostname to connect. Audio streaming and remote printing are NOT supported when connecting to Mac OS X and PCs running Windows ‘Home’ edition. The iOS app is a separate purchase that lets you access your Macs/PCs/Linux from your iOS devices. It’s not possible to remotely control an iOS or Android device whether you purchase an Mac or iOS app. The power to watch any video on your Mac, iOS device, Android device and more. With the MacX Video Converter Pro you get a feature-laden, high-quality, blazingly fast video converter. With 420+ video/audio codecs and advanced HD video decoding engine, you can watch and convert any video quickly and efficiently. With an intuitive interface, this is hands-down one of the best all-in-one solutions to convert and download video, (not to mention make photo slideshows, record screens, edit videos, and more). This converter delivers a quick, easy way to convert your favorite videos for burning a DVD or transfer them to your mobile device to watch on the go. You never have to worry about compatibility issues because you can convert any video to over 180 video formats, such as M2TS to MP4, MKV to AVI, WMV to MOV, FLV to AVI, MKV to MP4, etc. You can even extract audio from video files and convert it to 14 popular audio formats, including MP3, WAV, AAC, FLAC, ALAC, etc. Fastest Speed and High Quality – Optimizes the encoding and decoding for HD 1080p and 720p videos, up to 32x faster with 98% quality preserved. 280 Preset profiles for Apple and Android Devices – Preloaded profiles make any video file playable on iPhone (iPhone 5S/5C included), iPad, Apple TV, iTunes, Android mobile devices, and other gadgets like Kindle Fire HD, Google new Nexus 7, Surface, PSP, etc. Editing Capabilities – Trim, merge, crop, and add subtitles and watermarks to your videos. Create Photo Slideshows – Turn your photos into a video slideshow with background music or voiceovers and share it with friends. Astounding YouTube Downloading and Converting – Download video and MV from YouTube and convert it for offline playback without restriction. 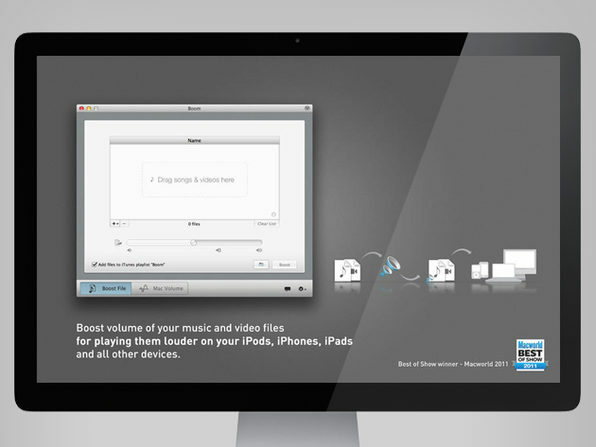 Powerful Screen Recorder – Capture non-downloadable online videos or record iTunes DRM video for unrestricted enjoying. Record iTunes DRM video and play it on any mobile device you like. Camera Video Recorder – Record video with built-in or external webcam and convert video to FLV, AVI, MP4, MOV, etc. 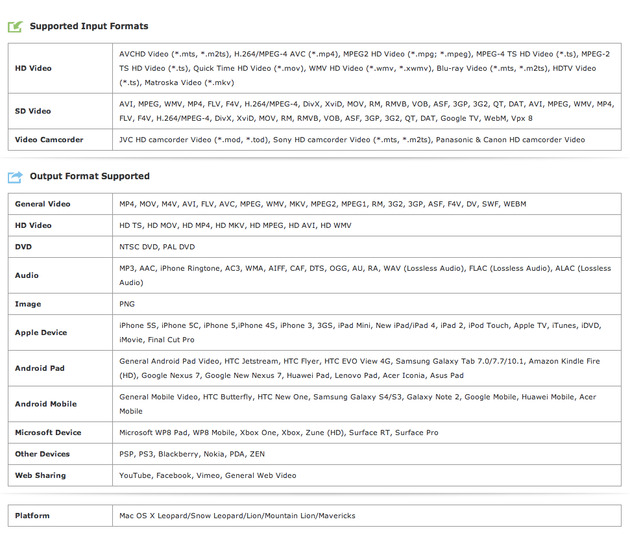 Compatible Inputs: AVCHD, MTS, M2TS, HD MKV, AVC, TS, MPEG2 HD, MPEG-2, Quick Time HD, WMV HD, HD camcorder video, Blu-ray Video, HDTV Video, Matroska, MOD, HD TOD, AVI, MPEG, FLV, H.264, MPEG-4, WMV, MP4, F4V, MPG, DivX, XviD, MOV, RM, RMVB, VOB, ASF, 3GP, 3G2, QT, DAT, Google TV, WebM, Vpx 8. 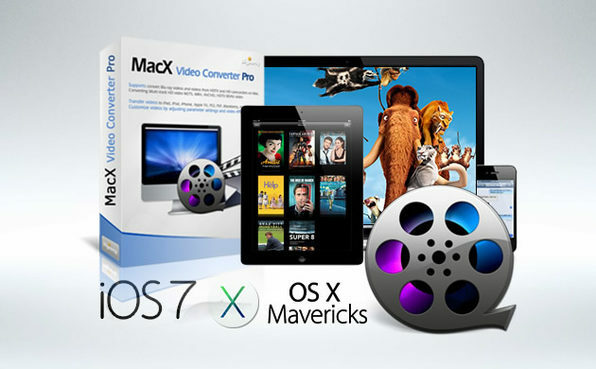 Compatible Outputs: AVI, DivX, XviD, MP4, FLV, AVC, MPEG, WMV, MOV, YouTube HD AVI, HDAVC, MPEG4 HD, MPEG-2 TS HD, WMV HD, Quick Time HD Video, VOB, iPad (iPad 2, iPad 3, iPad 4, iPad Mini), iPod (iPod classic, iPod touch, iPod nano), iPhone (iPhone 3GS, iPhone 4, iPhone 4S, iPhone 5), Apple TV, PSP, PS3, PS3 HD, Xbox, Xbox 360, Zune, Zune HD, mobile phone, Android, PDA, BlackBerry, Nokia, Creative Zen, MP3, PNG. Boom is an audiophile’s dream with intelligently loud volume and a variety of equalizers tailored to provide the best acoustics. Say goodbye to low volume and transform your Mac’s whimper into a fully-fledged audible experience. Boom seamlessly integrates itself within your Mac, all you have to do is adjust the volume as you wish. From videos on YouTube or Hulu, your favorite music playing on iTunes, to voice applications like Skype, FaceTime and your favorite games, Boom can boost them all. Add to that the ability to boost audio and video files and you have the ultimate audio quality for your Mac. Boom will improve the audio quality from the Mac’s built-in Stereo speakers on the latest MacBook Air, MacBook Pro, MacBook Pro with Retina-Display and the new iMac, as well. Use one of 16 equalizing presets such as Jazz, Acoustic, Dub Step, and many more or just customize your very own preset to something unique. 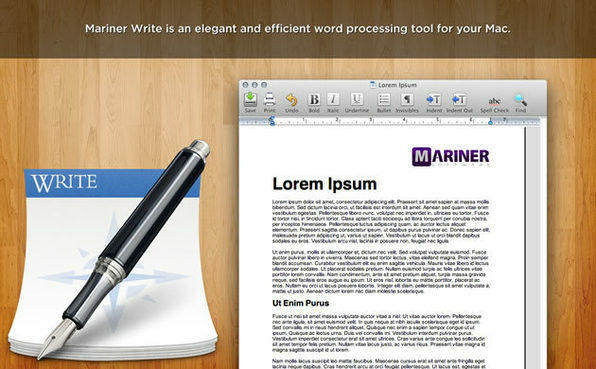 Mariner Write – your Mac OS go-to word-processing tool. Whether you write for a living, are an educator, or you’re a student, Write has all the functionality you need for that important letter, technical paper or research project. Elegantly efficient and powerful, Mariner Write turns out great-looking documents. Create customized headers, footers, endnotes or footnotes. Use Mail Merge to automate a mailing. Mariner Write empowers you to create your own word-processing environment so you can produce documents that are clean, consistent and professional. Over two decades old, Write has accumulated thousands of loyal users. And in a time where most word processors include everything but the kitchen sink, Write is streamlined with only the features and functionality you need. Let us introduce you to CameraBag 2, a photo app for your Mac with a whole new approach to editing. Redesigned from the ground up, CameraBag 2’s Analog Engine pairs a full suite of photographic tools with the high-quality filters and vintage simulations Nevercenter is known for. Its key innovation is a stunningly straightforward approach to layering, rearranging, and endlessly tweaking all of these effects in real time. The 150+ fully-adjustable filters and 30+ professional controls are only the beginning, forming the palette from which you can find, and create, your own styles. CameraBag is designed to be professional, elegant, and also simple to use. It gives professionals the control they want, and everyday photo-takers accessible tools for photo enhancement. We see beautiful photos from CameraBag users as they gain control over their own creative photo-editing process. Freedom to Play – CameraBag 2 lets you see all the possibilities at once: choose from side-by-side comparisons with the full-screen Quicklooks, or get large, instant previews on mouseover; the emphasis is on creative exploration. Non-Destructive Editing – Endlessly layer, nest, rearrange, and tweak all of CameraBag’s effects in realtime non-destructive editing, so your photos always retain their smooth color gradations and quality. Advanced Control – Full suite of photographic tools, from simple exposure or cropping to advanced vignetting, color correction, and curves. Customizable Filters – In addition to the 150+ built-in filters, adjustments and styles can be freely layered to create new looks, which can be saved right into the interface as new filters. The Analog Engine – At CameraBag 2’s core is the Analog Engine: high-fidelity, 32 bits-per-channel, non-destructive, multi-threaded image processing. In other words, it’s fast and smooth. 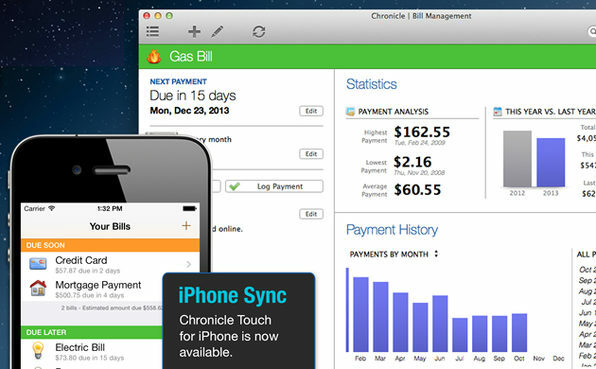 Chronicle is the easy-to-use personal finance solution for Mac. Late fees will be a thing of the past with this versatile software that keeps track of all your bills and uses iCal to remind you of upcoming due dates. With Chronicle you can track and reduce your debt, keep proof of payment history, view bills at a glance, make online payments and most importantly, pay your bills on time, every time. One late payment can wreak havoc on your credit score, leading to higher interest rates and denied loans — in short, completely affecting your financial life. That’s why you need Chronicle. It makes it beyond easy to remember when your bills are due, and helps you pay them online so that you never face a late fee. It eliminates all the stress surrounded by trying to remember if and when you paid your bills. iCal Payment Reminders – Reminds you to pay your bills, even when it isn’t running. Accurate Records – Keep proof of payment history and compare year-over-year expenditures on expenses. Sync Across Devices – View all the same information on your iPhone or iPad by syncing with the iOS Version. Tired of waiting around for all that music to download? Or for that matter, ready to fall asleep while you’re waiting for that much anticipated movie to download? 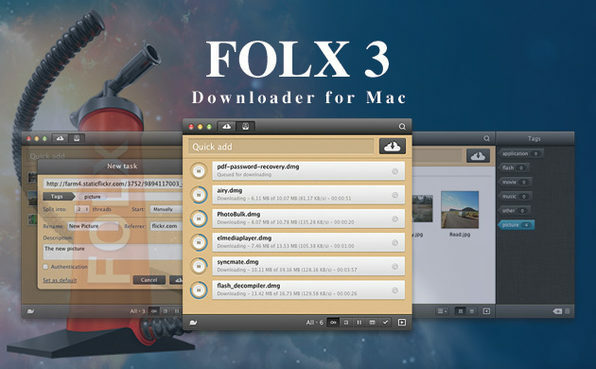 Enter Folx Pro: Folx PRO is a powerful download manager, which boasts the ability to split downloads in threads, resume interrupted downloads, organize and manage downloads. This is the kind of app that will get your download times breaking records and your Mac happy with all of that sweet sounding music you’re hooking it up with. 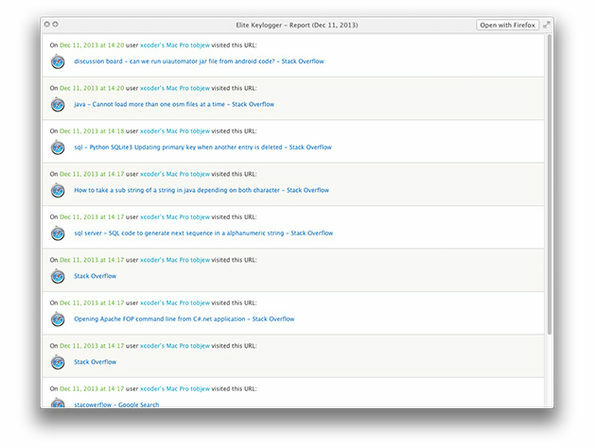 Plus it has a handy file management system that makes finding any file you downloaded with Folx the quickest possible. Assign a tag or several tags to each downloaded task and it easily finds them whenever you need, even if they were downloaded ages ago. Split Your Downloads – Split up your downloads into ten different threads to speed them up. Schedule Downloads – Schedule your downloads in advance so you can stay on top of everything you download, and define Folx exiting behavior so when your downloads are finished you can have your system shut down, go to sleep, or quit Folx. Smart speed adjustment – Your download speed will automatically be adjusted whenever you need to use Internet traffic from other applications. File Management System – Intuitive tagging and management system allows you to find any file downloaded with Folx instantly. iTunes integration- Integrate Folx with iTunes so all of your downloaded music and videos can automatically go right into your iTunes library. 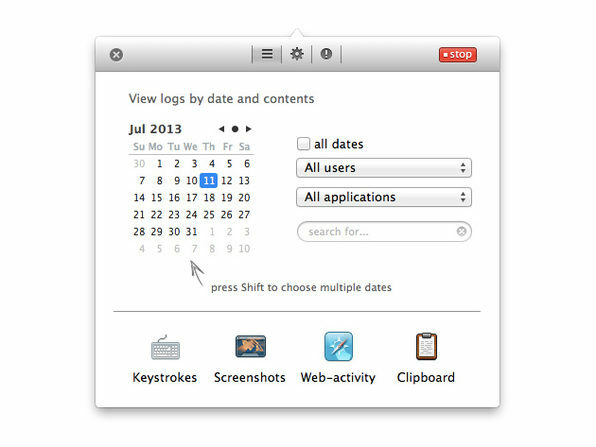 If you share your Mac with other people and want the lowdown on how they use it, you need Elite Keylogger Pro. The premier personal monitoring software for Mac, Elite Keylogger Pro will help you safeguard usage of your home or office computer, protect your loved ones and co-workers from online threats, and ensure you know exactly what’s occurring on your device at all times. 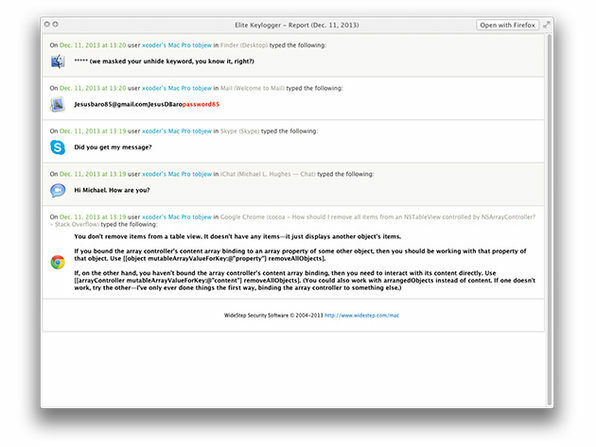 Monitor IM chats on iMessage, Skype, Viber, etc. What’s an Pay What You Want bundle? It’s a time-limited opportunity to buy a collection of apps for whatever you want to pay! Our bundles are exclusively constructed and are made for anyone looking to discover the best apps around the globe. What happens if I pay LESS than the average price? 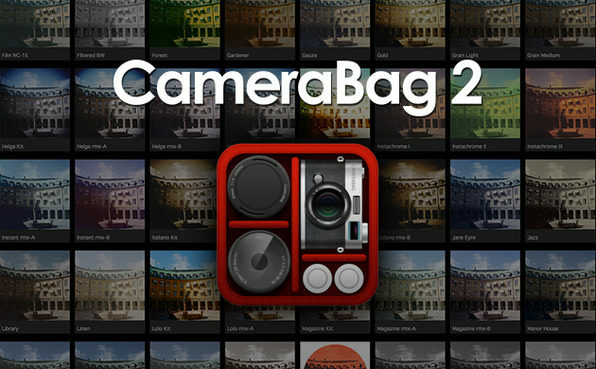 You'll only receive 4 apps: Camerabag 2, Chronicle 5, Folx Pro, and Elite Keylogger Pro. Because this is a unique type of offer and customers can pay whatever they want we need to incentivize a healthy price for the developers included in the bundle or else people might just continue to pay $.01 and if that were the case we wouldn't be able to exist. What happens if I pay MORE than the average price? 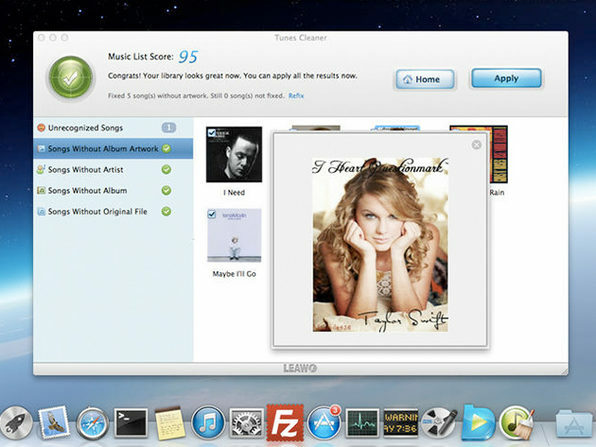 You'll receive ALL 11 Mac apps :).